Potatoes are tuberous crops from the nightshade family. They were introduced to Europe in the second half of the 16th century by the Spanish. A rabbit’s digestive system is specialized for consuming large amounts of plants which are rich in fiber and low in fat. 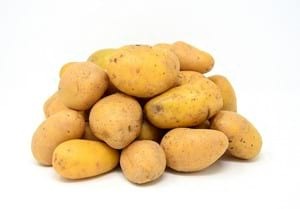 As a result, food types high in carbohydrates, like for example potatoes, are likely to cause digestive upset. When fed often, they may even lead to more serious health problems. Feeding a little bit of potato isn’t necessarily harmful to a rabbit. That being said it doesn’t really have a positive impact on their diet either. As such we recommend opting for other more beneficial treats. We did come across some accounts in which people mention they feed their rabbit a small amount of potato every day but this was based on veterinarian advice. If you are wondering if rabbits can eat sweet potatoes, then the answer is that we also advise against it. Even though sweet potatoes are only distantly related to the potato and do not belong to the nightshade family, they are still packed with carbohydrates and contain more sugars than potatoes. Conclusion: our advice is to not feed potatoes as there are plenty of other healthier treats you can offer your bunny. Do you offer your rabbit potatoes? Feel free to let us know.